Willow Grove Physical Therapy: What is IASTM? In Courtney’s previous blog she mentioned how IASTM can be effective for Achilles Tendionopathy. I would like to take the time to give you more information about IASTM and what other injuries it may be effective in treating. 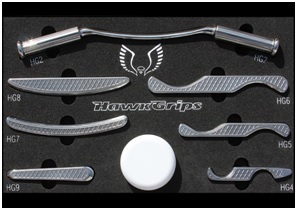 At our office we use Hawk Grips, which are a specific type of IASTM. Hawk grips were developed by an actual patient who had undergone physical therapy for a neck injury. He found positive outcomes by his physical therapist using Graston technique on his chronic neck injury and decided to develop his own set of tools. Those tools are now called Hawk Grips, as he was a St. Joseph’s University graduate. Hawk Grips enable us to identify soft tissue restrictions in the tissue, as the tools provide feedback (such as vibration) that feels to us as if we are going over rumble strips in the road. Once we identify that area of restriction we are able to concentrate our treatment to those tissues to promote healing. IASTM is gaining popularity and the evidence is growing for use in conjunction with other therapeutic techniques, including active stretching and exercise, manual therapy and modalities. We should be implementing IASTM for those appropriate patients with soft tissue injuries; otherwise we may be putting them at a disadvantage in their recovery. We are lucky to have access to the full set of Hawk Grip tools at our office and use them daily with positive outcomes.